CTI Paper USA offers an eclectic ensemble of specialty papers and envelopes designed to inspire creative genius. Elegant, sophisticated, fresh and fun - The Fine Paper Collection® includes the world's finest translucent paper, cast coated paper and metallic printing paper available. CTI continually strives to develop, manufacture and source these innovative papers and envelopes, which are perfect for making distinct impressions when used for annual reports, birth announcements, brochures, business cards, covers, greeting cards and wedding invitations, among other things. This exquisite collection is readily available through nearly 200 local paper merchants, converters and online at The Paper Mill Store. 5-acre campus in Sun Prairie, Wisconsin, and its 72,000-square-foot converting and distribution center is in the heart of the "Paper Valley" in Neenah, Wisconsin. 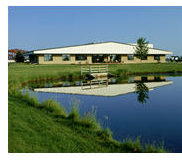 The Neenah facility also houses a comprehensive technical laboratory, where Research and Development staff formulate custom coating solutions as well as analyze and test paper properties. In addition, CTI maintains regional sales offices located throughout the U.S. in Minneapolis, Los Angeles and East Greenwich, RI.